Made another file folder with the Stampin Up Envelope Punch Board. 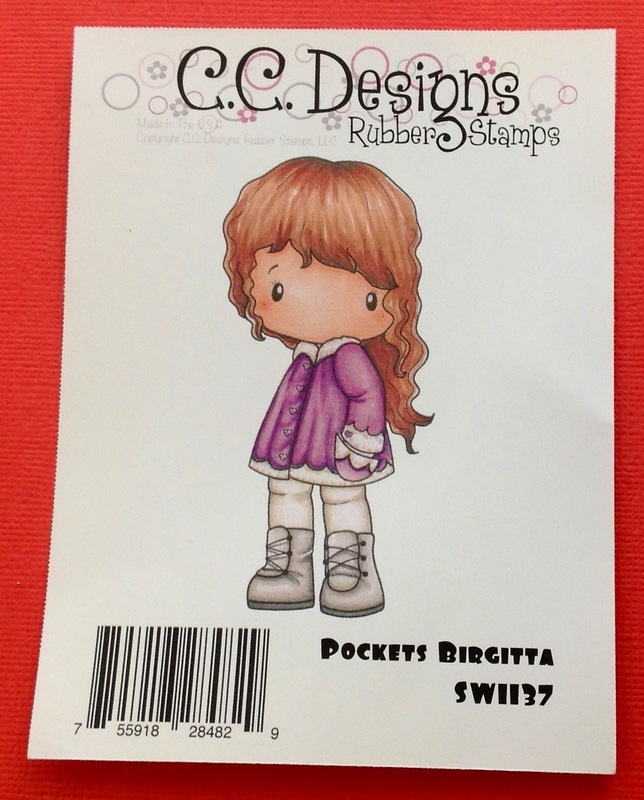 Used CC Designs Cute Birgitta. Hmmmm….lots of space on the right, may need to add something…. That’s my brother and hubby. 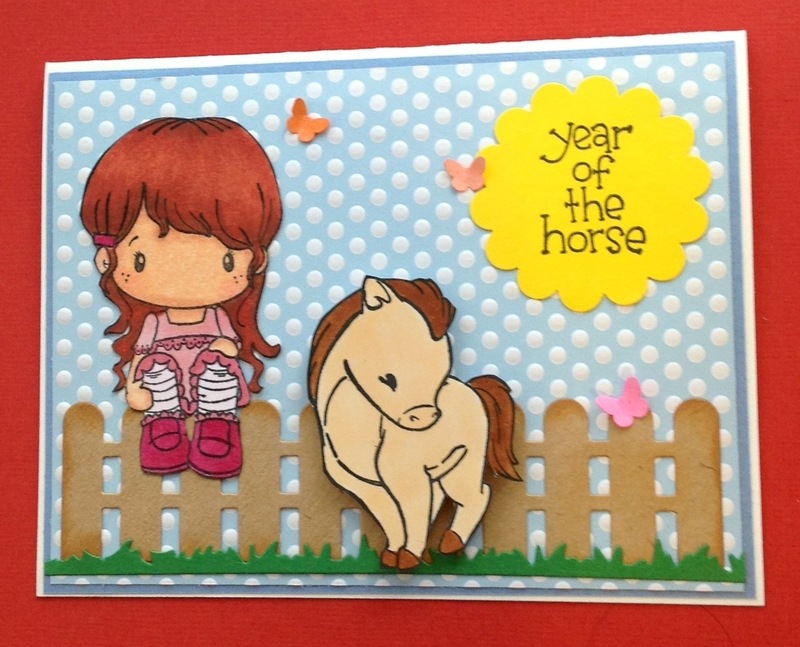 Used the Horse from the Sister Stamps. Sentiment is from Dandelion Designs. 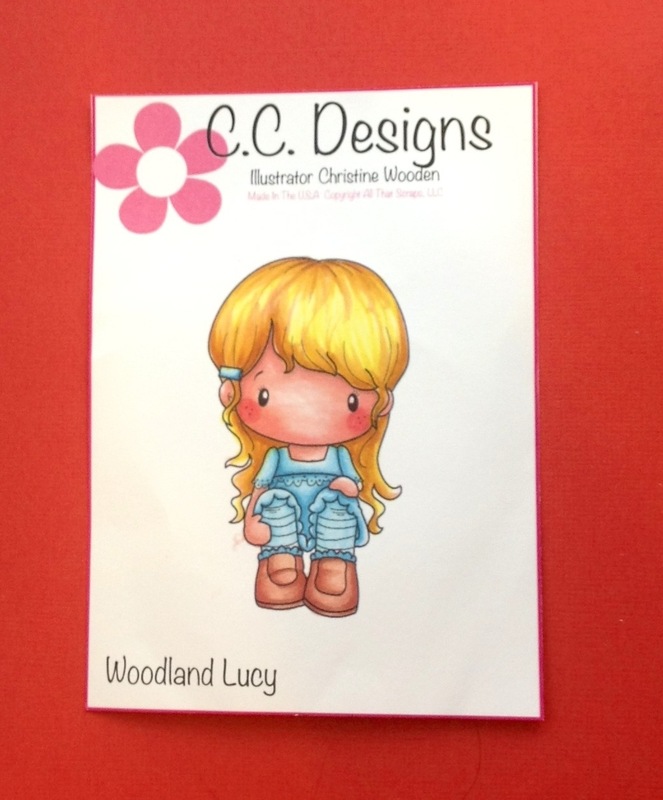 Used Woodland Lucy from CC Designs. The fence and grass are also from CC Designs. Butterfly was from an older Martha Stewart punch. Used the Stampin’ Up Envelope Punch to make a file folder card. Go on You Tube and you’ll find a number of tutorials. 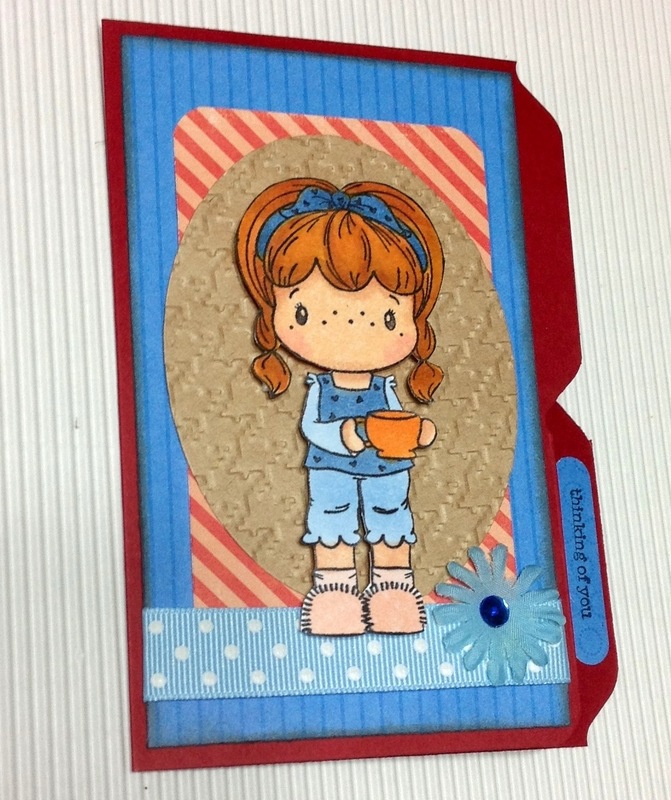 Used Coffee Birgitta from CC Designs to make a Thinking of You card. 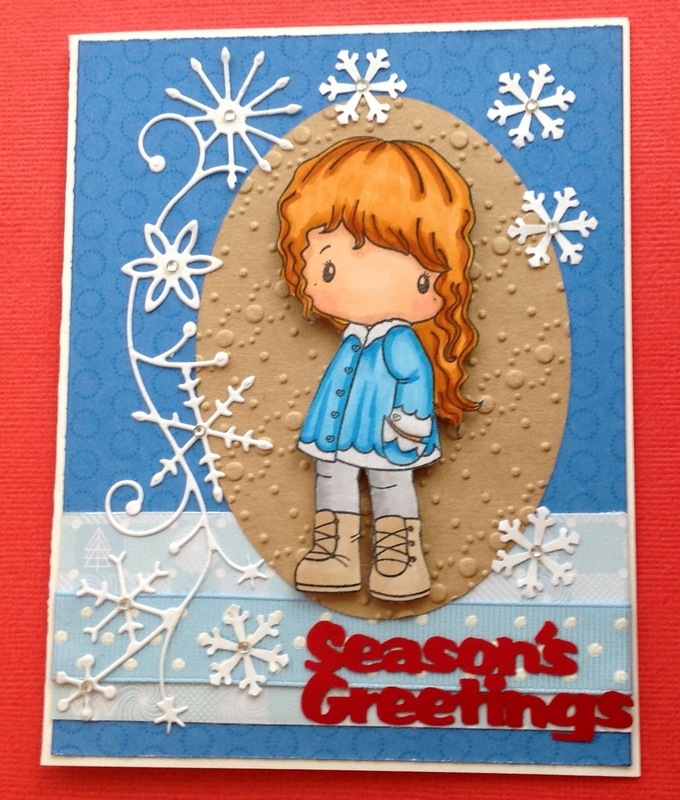 Here is a very quick and simple card using Nora from CC Designs. If you live in Oahu, check out Cute Stuff Hawaii closing out sale 85% off. Got a lot of paper, stamps and other goodies yesterday. Here is Ornament Trevor by CC Designs. Made a little side pocket to place a gift card that slides out. Memory Box Scalloped Corner Notches. Used Pocket Birgitta from CC Designs. Used the Memory Box Snowflake Corner. Used Miyono from the Sister Stamps to make this very quick card. Paper pieced her clothes using washi paper. Must have all of these on your card. Went to Kahala Mall, got lucky with the parking. Got what I needed, bought lunch, saw my cousins Rae and Dawn and was out of there. Stopped at the post office and now I’m home. Used CC Designs Trimming the Tree. This is an older one. Using the Memory Box Frosty Border again. Can’t say enough how I just LOVE the laser cut sentiment from Island Scrapbooking. Sentiment was from Island Scrapbooking Laser cuts. Silver bling blings, gift from Sandy from awhile ago. Comes in many many colors, thanks Sandy. Trying to finish making Christmas cards, so far behind this year. Requirements for the December ATC was include the colors red, black and gold. Nice cards everyone. I will be listing next years monthly ATC swap themes. Here are Anne’s Christmas card. Here’s Elf Lucy from CC Designs minus the ornament ball. Used the Memory Box Frostyville Wreath. Found at All Natural Accents. Embossing Folder was an older Sizzix but I don’t know the name. Laser cut Sentiment from Island Scrapbooking. Three more days of school…..
***Before I start, Roberta shared with me the upcoming coupon for Ben Franklin is good for Thursday and Friday. It is NOT for Saturday and Sunday. Used CC Designs Fuzzy Boot Birgitta. She’s sitting on a piece of ribbon I found at Paperie in Kahala Mall. Used the Memory Box Frostyville Border. 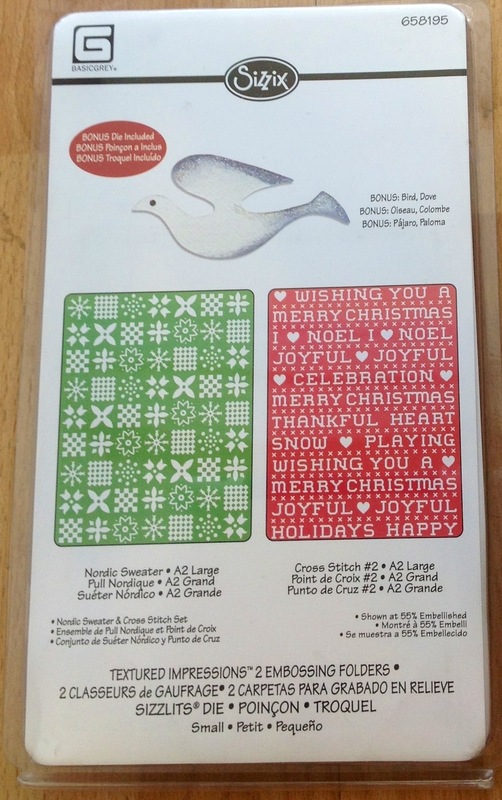 Used the Sizzix Cross Stitch Embossing Folder. Sentiment Happy Holidays were from Karen from a blog candy win. Laser cut from Island Scrapbooking on the Big Island. Check out her blog at Have a Scrap Happy Day. Used Snowflake Garland Marci from La La Land Stamps. Went to Ross in Waikiki at 8 am to beat the Christmas rush. Bought gift cards and found two 12×12 paper pad by My Minds Eye for $5.99. What a deal! Other stores sell the 12×12 paper pads up to $29.99. Anyway the paper patterns I wouldn’t usually use but the back side was plain craft paper. ..score. 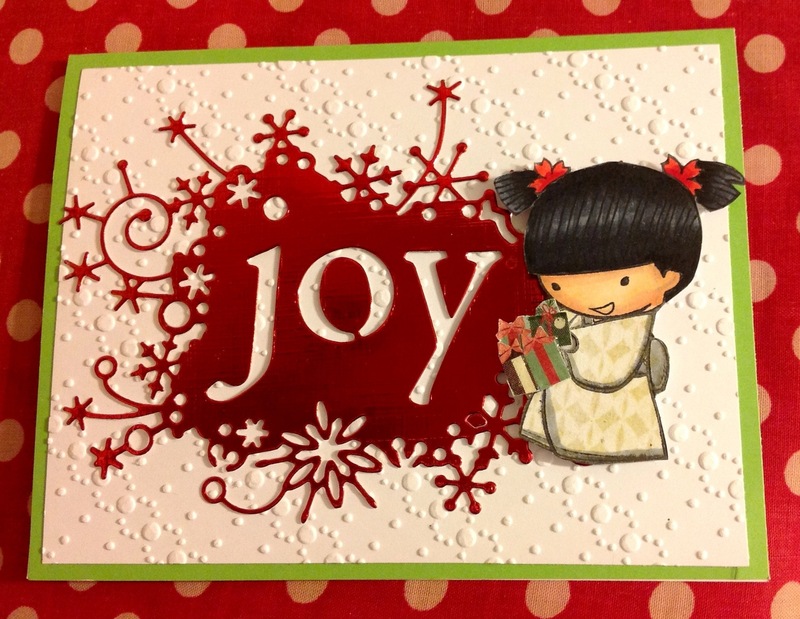 Used the craft paper and embossed with Darice Snowflake Embossing Folder. Used the Season’s Greetings from Island Scrapbooking. 10 a pack. Thanks Karen! Won them from Karen’s blog anniversary. 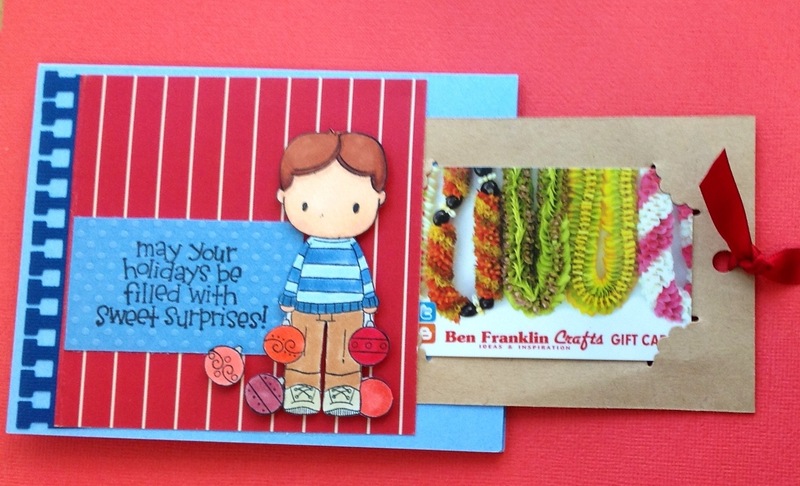 Check out her blog, Have a Scrap Happy Day. It’s pouring in Waikiki. Just heard the Flash Flood Warning. Everyone drive NICELY and be safe. Made two cards with Mako’s friends. Mako was not feeling well. Used the Stampin Up Hexagon punch. Oops….I will be announcing the winner of the giveaway #5 soon. Made these quick gift cards using the Envelope Punch. Go to YouTube and search for Katina Martinez. I altered the measurements but pretty much followed how she made the gift card. On one 12 x 12 double sided sheet, you can make 4 gift cards. The papers were recently bought at Cute Stuff for 75% off. Cut the paper at 4 1/2 x 6 inches. Score at 1 1/2 or 2. I tried both. The other end use the envelope punch at 1 inch, flip your paper and punch at 1 inch. Follow Katina to finish the gift card. I used Stampin Up Label Love for the to and from stamp. Then punched out using the coordinating Artesan Punch. To close the gift card just tuck it in. BFF Carol bought the Stampin Up Envelope Punch which I borrowed for this file folder card. I had ask awhile back your favorite color combinations. Roberta mentioned yellow and purple so I decided to try that combination. Used the Memory Box Winterberry Sprig. On YouTube, go to ChicnScratch for her tutorial. Used the CC Designs Candle Emma. The Stampin Up Hexagon Punch is one of my favorite punch. Found some of my paper at Cute Stuff Hawaii. Sadly the store will be closing at the end of the month. The paper and merchandise are 75% off. I received this adorable penguin card from Karen, Have a Scrap Happy Day. Karen is the Merry Christmas from Island Scrapbooking? Love it. Karen also made this calendar using the Dandelion Stamp. I am so behind with Christmas cards, calendars…. On Saturday taught a card making class to Mako and her friends. Here is the card we made using washi tapes. The sentiment is from Dandelion Designs. 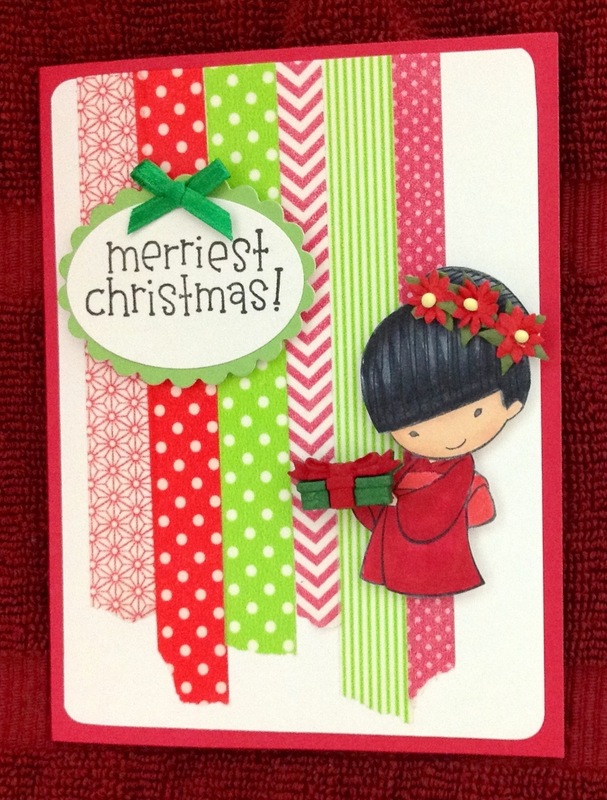 The tree is a stamp from CC Designs Christmas Meoples. THIS POST WILL STAY ON THE TOP. CHECK FOR MORE POST BELOW. This will be another quick one. -Make a comment about when you craft the most or just make ANY comment. I usually craft in the evenings. The winner will be chosen randomly on Dec. 15, 2013. You are the winner of the Giveaway #4. She’s sitting on a Memory Box die called Winterberry Sprig. I won this die from Karen’s Blog Anniversary. The other Memory Box dies used were the Debutante Frame, Marshmallow Clouds and Puffy Clouds. After gluing down the sprig, the glue was messy so I used this eraser to erase the excess glue. Don’t know what you call it but it works really well. Last day for the giveaway. 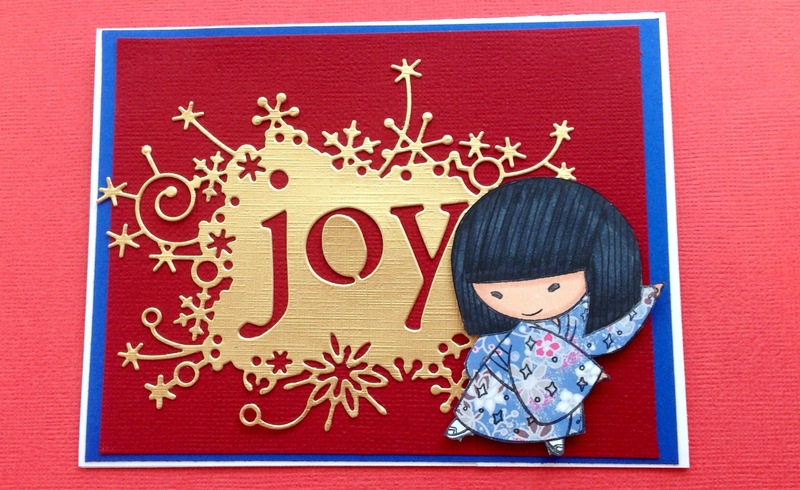 Here is Miyoko from Sister Stamps. Swapped out her cupcake for a present. Trying to use up my washi tape stash. Flowers from All Natural Accents. 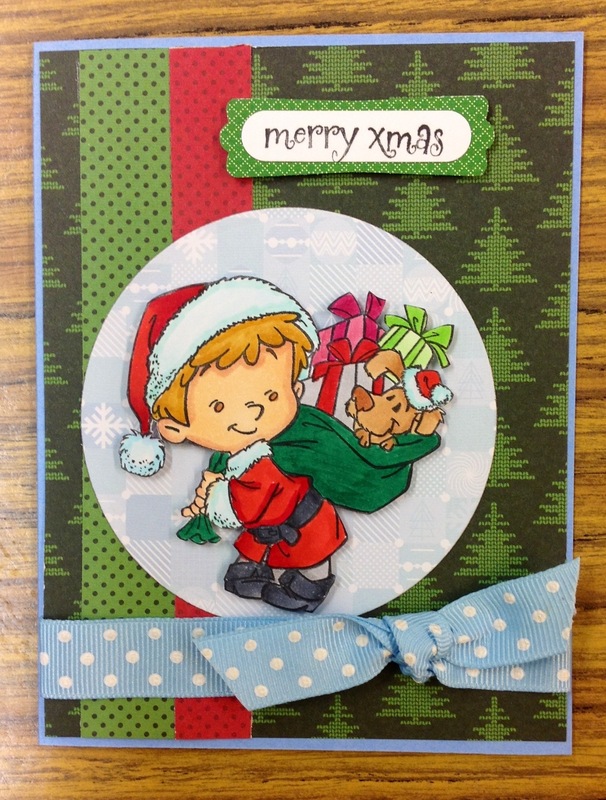 Used the CC Designs Rubber Stamps Henry Claus. Used this bear stamp from Exclusive Designs by Andree. Roberta sent this stamp to me along with other goodies. She also sent Forever Friends 15 patterned paper and cut outs. Also supplied by Future Publishing. Altered Akemi from the Sister Stamps. 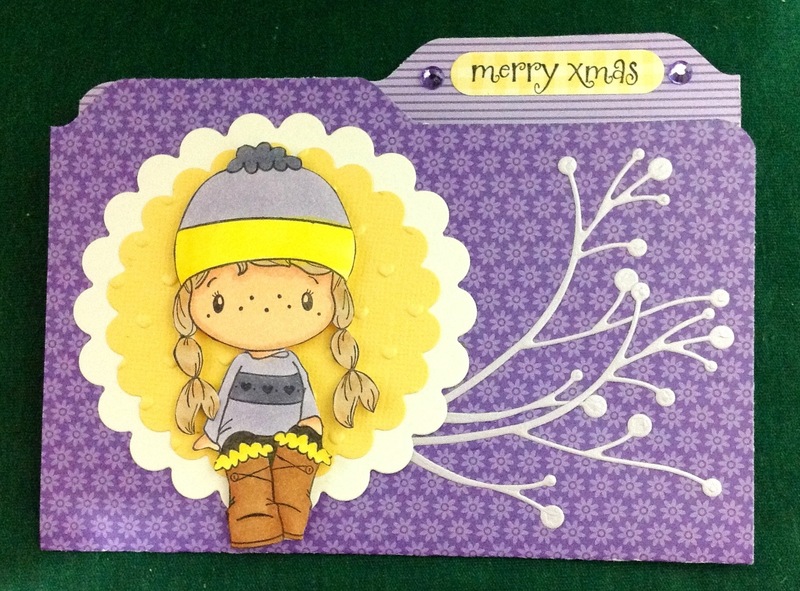 Used the Memory Box Winter Joy.